Happy Earth Day! April 22, 2016 is the 46th year of celebrating Earth Day. Earth Day is not just about one day a year but rather to bring focus on our Earth and keep it going all year long. Whether you are planting a tree, attending a rally, picking up litter, recycling materials or bringing awareness to our precious Earth in some other way, the key is to DO something. As they say, every little bit helps and our Earth needs every one of us to do our part. 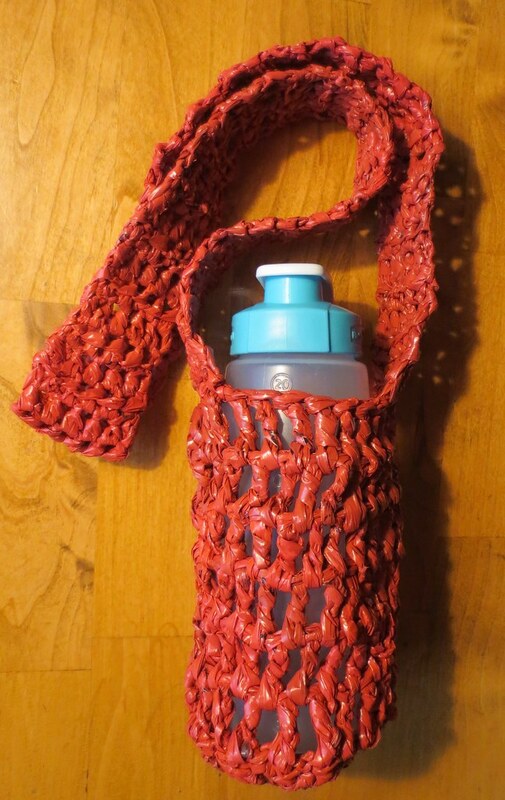 If you are a long time reader of this blog, you know I love to recycle materials and use them to create new and useful items. I recycle plastic bags, plastic packaging, t-shirts, old linens, cassette and video tapes, and denim jeans. I also reclaim yarn from old sweaters and repurpose plastic lids, rings and old purse handles. I try and do my part which I know is a small thing and again when we all do a little, it can make a big difference. I was so excited to receive these unique vintage red newspaper bags from an on-line friend Judy. She saved them from her delivery of a newspaper and mailed them to me. I cut about 30 bags into 1 inch wide strips using this newspaper plarn-making tutorial for the narrow bags. Here is a photo of one of the long narrow newspaper sacks I recycled into yarn aka plarn. 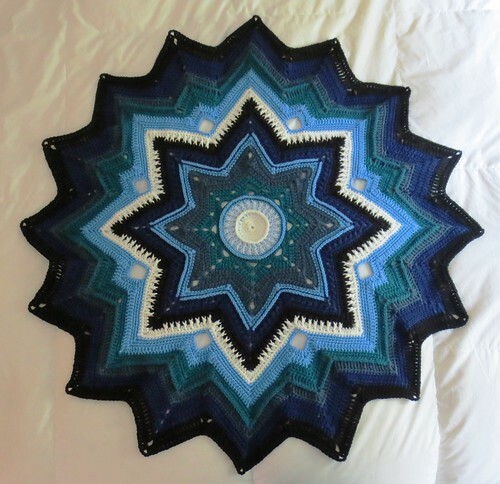 Just a quick post to review and share the Mini Galaxy of Change blanket pattern. I have crocheted other blanket patterns from Frank O’Randle and have enjoyed working the unique stitch patterns he presents in his works. 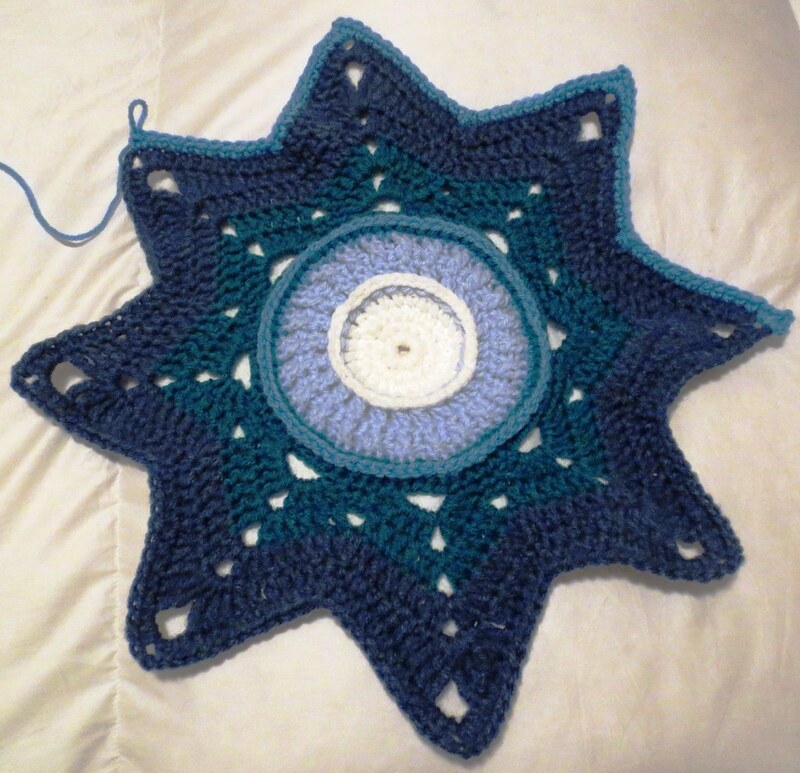 I crocheted the blanket with a H (5 mm) crochet hook and used most of the colors called for in the pattern. I did use Teal colored yarn instead of one of the blues as I had it on hand. Here is a closeup of the center portion.